I have been blessed to be involved with WhatChristiansWantToKnow.com for several years, almost from the beginning. We have enjoyed the writings of several guests as well as some regular staff writers. One such staff writer is David Peach. My friendship with David is really very virtual however God gave my husband and I the opportunity to actually meet David and his family as they were traveling through New Mexico some years ago. What a blessing it was to share a meal with this sweet family and talk about the Lord. Throughout the years as I have enjoyed reading and editing David’s writings, I thought it might be fun to share some great things that I learned from David Peach. I hope this encourages you to read or re-read the things that David has contributed here at WCWTK. While I have read about Simeon in the Bible many, many times, I never really stopped to think how very patient he must have been. David shares that even though “The Bible does not indicate how long Simeon waited for the birth of Christ, but the fact that it says he would not die until he saw the Saviour indicates that he waited some time.” Yes, David, this is very true. Thanks for opening my eyes to that fact. 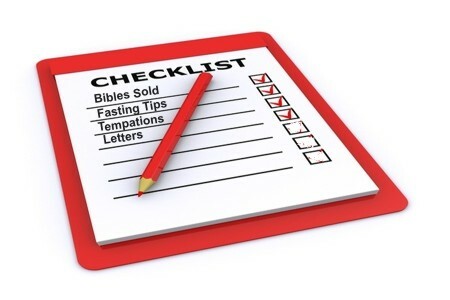 A great article of tips and advice from David is called “10 Fasting Tips” A Christian Guide”. Personally I am not a faster, it really has to do with my own personal medical need, however if I were to fast I think the best tip David gave me in this article is about caffeine. He said “Several days before your fast begins, you should start weaning yourself off caffeine. Some people experience unbearable headaches 2 to 3 days after ceasing to drink caffeinated products. During your fast you will already be acutely aware of your stomach. There is no need to add a second discomfort if it can be avoided.” Simple advice that may help you avoid that headache. More great tips and advice, I love what David shared in his article: How To Write a Support Letter for a Mission Trip. Of particular note I like how he said “Be direct … After you introduce the trip and how excited you are about going, tell the recipient exactly why you are writing. Tell them how much money you need and that you are dependent on gifts from others to help you on your trip.” Excellent advice my friend! I was reminded that we really need to consider this and strive to not be a stumbling block to others that may suffer from a temptation that does not affect us personally. Was He Really That Young? I thought I knew about this man and David reminded me that there is always room to learn more about such great men of faith. Thanks for sharing David! Thank you brother for this gentle nudge. You can read his full article: Teaching Children Respect: 7 Helpful Tips. I could go on and on but I have a better idea. Read David’s stuff yourself. You can find all of his articles at this link: Articles by David Peach. David can teach you, I know he taught me and I love re-reading what he wrote. Previous post: Are The Ten Commandments Still Relevant Today? Next post: What Are Some Other Names for Jesus in the Bible?